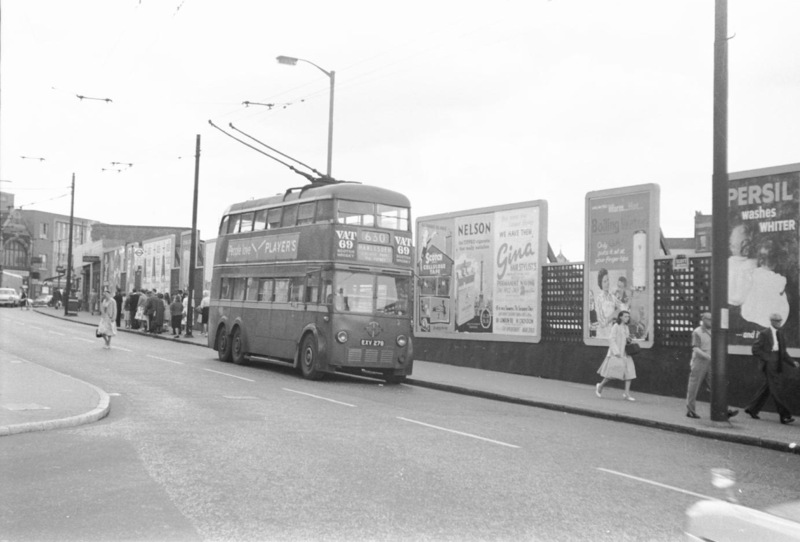 In 1959, a short stop-over at the West Croydon terminus for this trolleybus on route 630. Shortly the 14 mile journey to Harlesden will take place. Oddly, passengers were not allowed to board the bus at the this point, having to join the vehicle on the opposite side of the road after the vehicle had turned. Quite good for passenger relations on cold, rainy days. Trolleybus enthusiasts travelling over each route wished to wire wipe every piece of overhead wire. This particular turning loop was almost impossible to traverse due to the diligence of an inspector at this location. It was only on the last night of operation, did I achieve this particular ambition. 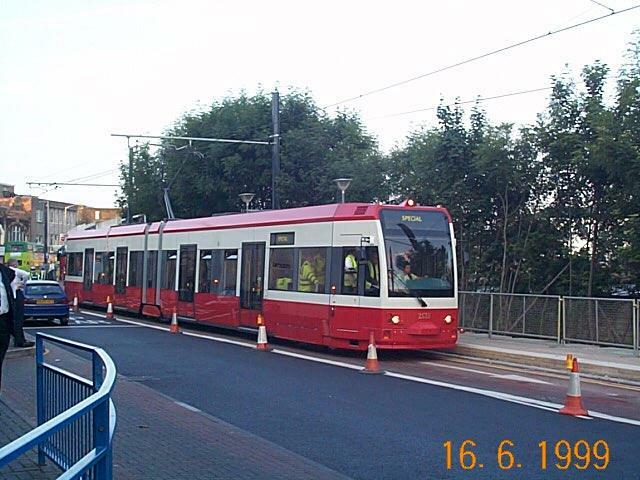 Forty years on to 16 June 1999, the very first Croydon Tramlink car is passing the same location in Station Road, West Croydon. I am uncertain when the advertising hoarding's were removed, but their disappearance has improved the visual appearance at this location. Sadly by November 1999 the tree screen had been substantially cut back with a modern electronic advertising / information screen planted instead. In the early 1960s I had a pretty simple requirement to commute from Thornton Heath to Wimbledon. Use of the Croydon - Wimbledon line was tried for a couple of months, but proved to be quite useless as the interchange times always meant a half hour wait at West Croydon, and the journey itself was frustrating slow. The option of travel via a change at Streatham proved to be much quicker. Forty years on, is it much better? I don't think so. Interchange between rail and tram at West Croydon is poor, especially for Wimbledon bound passengers with a change of tram at East Croydon. Best to interchange at East Croydon if at all possible. Perhaps that is why there isn't a decent interchange facility at West Croydon but I still wonder why, from the onset, there was no provision for an exit from the railway station directly onto the Tramlink stop, especially as the service replaced the former train service? I seem to remember that it took around half an hour by train to Wimbledon, the Tramlink service isn't any better with new additional stops but is more frequent. Good Question! It should have been done, it is so simple and would save a considerable walk around. Railtrack's current NMS says "Improved connections at West Croydon" and I'd think that would mean a back entrance for the trams and buses but nothing has come of it yet. The irritating thing is that this access does exist! There is a door in the wall that runs along the back of the down platform [platform 4] at West Croydon that opens directly onto Station Road adjacent to the gear knob shop on the corner. It is normally kept locked and padlocked, but when rail-replacement bus services from West Croydon are operating from Station Road it is opened to allow direct access for passengers.